Somewhat disappointed to read that the Party Board is recommending "grouping" or MCAs should be voluntary. In other words, failing and dysfunctional Associations who damage the party's brand and provide no political leadership or campaign support will be allowed to continue. This week alone Cllr Paperclips and I have dealt with 23 calls or emails from Associations outside the West Kent Group asking for support; from IT help, to printing and design, to guidance on rules and selections, to help with by elections and delivery. All demand their "independence" even though many clearly lack the most basic campaign, leadership and management skills. In some cases we know the Association is keen to learn and is using us as a stepping stone to greater knowledge. But in too many cases we are simply being used as a crutch to prop up a failing organisation. In one case an Association with over 700 members actually emailed CCHQ to ask if West Kent could deliver their leaflets as they had no one local to do it. It would be amusing if it wasn't so tragic. I appreciate the Party Board doesn't want a fight, but with office comes responsibility. And that includes responsibility to meet the basic minimum standards required of an Association Officer. If you don't have the skills, hand over to someone who does. Here end the rant of a tired and irritated agent! Please use the button below to reserve and pay for your place(s) at the West Kent Council Election Seminar on Saturday 5 November at the Grange Moor Hotel in Maidstone. For those of you who follow what we do in West Kent, tomorrow we commence packing envelopes for our 2016 Christmas Draw. As well as targeting our 3,000 members and donors, we also send tickets to 10,000 pledges (2,000 per Association). We do this on a strict rotation, focusing our efforts on 10 new wards every summer and Christmas. For the 2016 Summer Draw around 25% of our draw income came from pledges (over £2,000 from the £9,000 raised). This activity not only increases income, but ensures our donor base is constantly expanding for the future. We only send pledges £10 worth of tickets as this is a simpler "entry point" than the £20 worth sent to members and donors. The letters are hand delivered by volunteers saving outbound postage, wherever possible with a local In Touch newsletter. Here is a sample of our 2016 prospecting letter to pledges in Chatham & Aylesford. "Well, one must admit that one has not yet read the proposals, but one must place on record one's opposition to what is proposed." A puce-faced man brandishing a dog-eared map had concerns about changes to the Lewes constituency due to "long-standing local animosities arising from the Battle of Lewes". They clearly hold a grudge in those parts considering the Battle of Lewes was fought 752 years ago. The Post-Referendum influx of new members must not be used be used to hide what I fear is still a long-term decline. It would be tragic if this temporary boost was used as a reason to abandon the proposed radical and much-needed reforms of the Voluntary Party. West Kent are involved in too many local government by-elections in the South-east to be under any illusion as to the true state of the Party’s grassroots organisation in much (though not all) of the region. I am not simply referring to a lack of technical skills (these can be learned) but, too often, a complete disengagement between the local organisation and the voters we seek to serve. In one constituency an entire County Council Division had just 3 (three!) Conservative pledges. 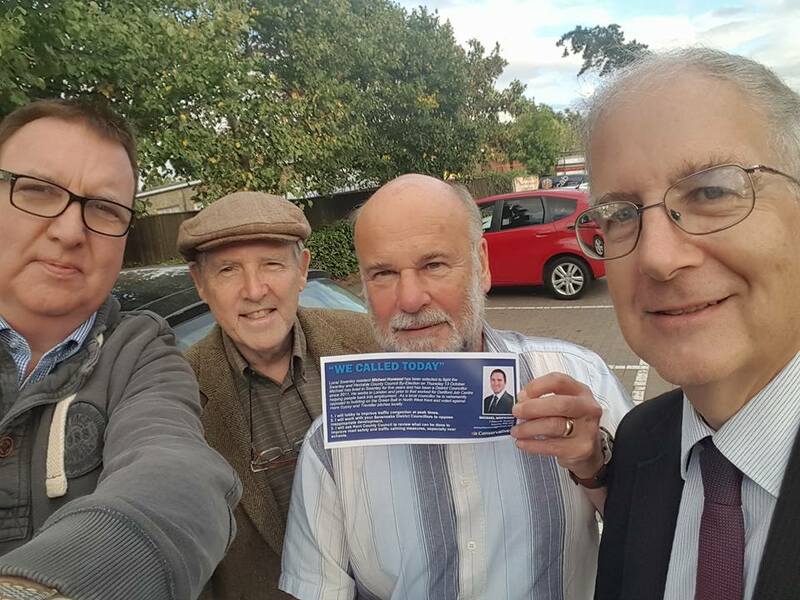 No-one knew if any canvassing had ever been done, or, if it had, where the previous canvass cards were, or if they had ever been data-captured. This did not come as a surprise to me as the same Association was at the centre of a row during the recent Police & Crime Commissioner selection meeting, when neither the Council Leader, the MP (a senior minister), nor the Constituency Chairman was able to vote as their names were not on the Association’s membership list! An Association unable to maintain its membership database is likely to fail elsewhere, too. Elsewhere … a Council Leader informed me that there would be “no doorstep activity” in a marginal local by-election, as the residents were “canvassed-out” (despite Vote Source recording that only 8% of residents had actually been canvassed in the past 5 years). Instead volunteers went door to door collecting signatures on a petition, but didn’t ask for phone numbers, email addresses, or any VI. The same people were then somewhat surprised when there were no pledges to knock-up on Polling Day. Unsurprisingly they lost the seat. And then …. There was the recent by-election in Kent, where the Candidate and the Association Officers readily acknowledged that they were in need of help, and accepted all the advice we gave them. For the first time, they had targeted deliveries, Pledge letters with variable paragraphs, and a full-scale GOTV operation. This time, we won – and took a seat from Labour, confounding everybody’s expectations. At the Spring Forum this year, during a debate on Party Reform, Lord Feldman patiently took questions for nearly two hours. As he courteously replied to some fairly hostile people, each predicting disaster if the reforms were implemented, two of us quietly sat at the back downloading the relevant Association’s accounts from the Electoral Commission database. One Association (whose chairman was particularly vitriolic) had lost money for 4 of the previous 5 years, and their website had not been updated from the previous General Election. Another (whose chairman accused Feldman of wanting to destroy the Voluntary Party) had spent £20,000 on running their office, and yet only £800 on campaigning, and. No doubt these Associations will be in the vanguard of those opting-out of any voluntary arrangement as they feel that they “do not need to change”. Last week’s announcement of the appointment of a new Vice-chairman responsible for training is a welcome and much-needed step. However appointing a Vice-chairman will achieve little unless the Party commits significant resource to achieving its objectives. This involves identifying the skill-shortages, developing suitable training programmes, and, most importantly of all (yet the part most likely to be forgotten) providing on-going assessment and mentoring for those being trained. Too often in the past, we have launched ambitious training programmes, but seen attendance at a training day as the destination, rather than being part of an on-going journey. And this, in itself, creates a fresh set of challenges. Who checks performance and provides on-going support? The present reality is that the County mentors the Constituencies, and the Region mentors the Counties. But this only works if the best people are elected to the County and Regional teams. Too often these bodies are the “elephants graveyard”; somewhere to send the cantankerous, the curmudgeonly and the confused. How on earth can a County Officer, whose own Association is failing, be taken seriously or given respect, when he or she starts trying to lecture others on what they should be doing better? I fear that there is also a danger that we will focus the new training programme on technical skills, when what we are really lacking are the “soft skills” needed to build and maintain a voluntary organisation. How to run Vote Source, or how to complete an election expense return can be read in the manual. What we need, however, is to support our Association Officers and volunteers in rediscovering the organisational and communication skills that we once took for granted. · And yes, the basic nuts of bolts of how to run an efficient, campaign-focussed Association, legally compliant and fit for purpose in 2016. The quality, dedication and skills of our local Association Officers is absolutely vital to future success. And whilst we may have some office holders who are doing it under duress because no-one else can be found, or for “one more year until someone younger comes along”, I don’t believe for one moment that any Officer takes a position without hoping and intending to do that job well. I wish Anthea McIntyre well in her new job, but training our activists in Best Practice will not bring about change unless we also give them the infrastructure to achieve that change. 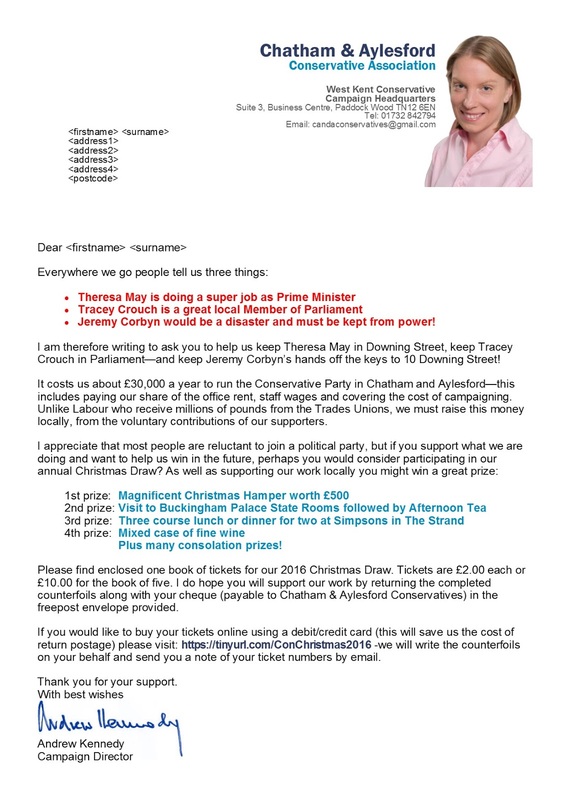 There is no point training councillors to write the best copy for newsletters if no-one has the time or ability to design and print them, or no-one is organised to deliver them to the voters. 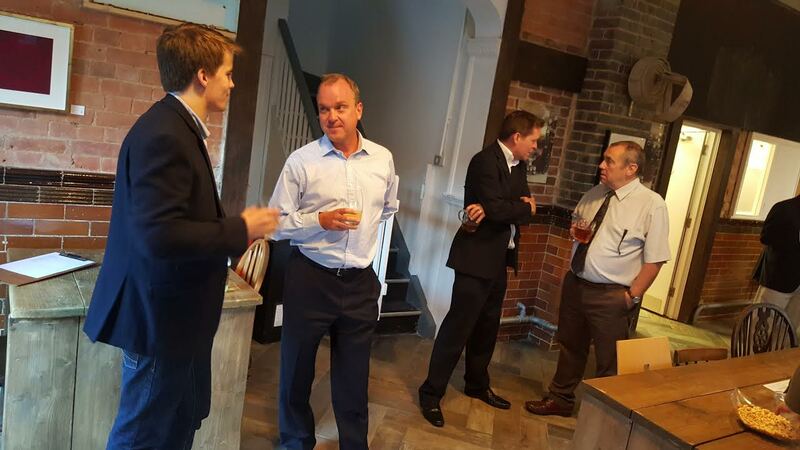 There is no point training the Deputy Chairman (Fundraising) on how to organise a profitable dinner if no-one knows who to invite, or how to attract a sponsor, or run the auction. There is no point training the Deputy Chairman (political) how to organise a successful canvass session if there no-one to print the canvass cards, data-capture and follow-up. We must remember that our Officers are volunteers and probably have many other demands on their time. It is unreasonable to expect them to spend hours in an Association office, designing, printing and data-capturing. And this is why Associations need professional, political and administrative support. The days of each Association having an Agent of their own are gone – and rightfully so, given the advance of technology. But putting self-interest aside, and working with others to promote success must surely be the future. Last night we took a canvassing team to Swanley to support Michael Horwood's County Council by-election campaign. Towards the end of the evening I knocked on the door of a young Polish couple, who had moved to the UK two years ago. As usual with hard working Polish people, both he and his wife were strong Conservatives. for the right to vote, such things become more important." Quite a humbling thing to hear, and a wonderful change from the dozens of totally disinterested residents I had met early who didn't seem to give a damn about politics or what was happening to their community. 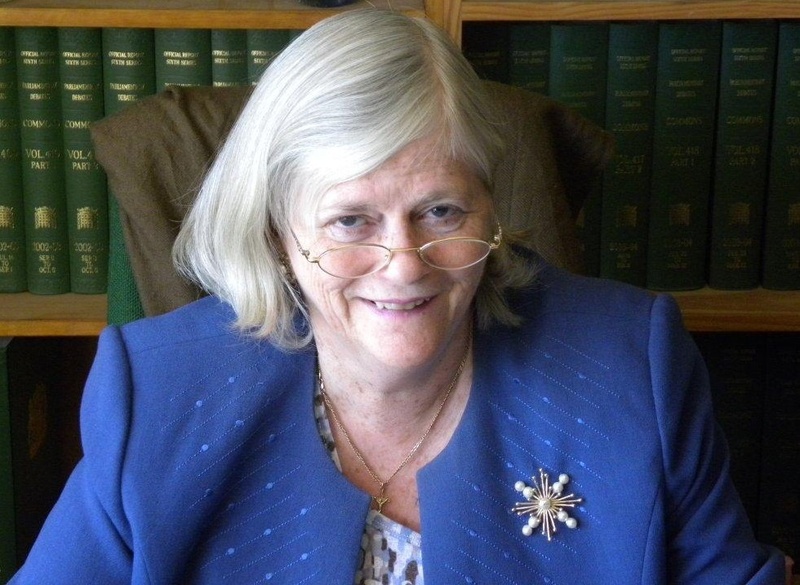 Members of the West Kent 500+ Club are warmly invited to attend the Club's end of year reception hosted by Rt Hon Ann Widdecombe. This will be held at the Ditton Community Centre, Kilnbarn Road, Ditton ME20 6AH from 7.30pm - 9pm on Thursday 3 November 2016. Tickets are £12.00 per person to include a complimentary arrival drink from the bar and a large selection of British and Continental cheese. Space is limited to just 200 guests so early booking of tickets is essential. A few weeks ago I was looking at a complicated fold on the instructions about how to install a new toner cartridge into the printer, and thought "we could use that for an election leaflet". Having driven Cllr Paperclips mad by scattering my aborted attempts at origami all over the office floor, I finally worked out exactly what I wanted. I then drove our long suffering graphic designer mad by taking a piles of paper covered with my illegible scribblings and asking her to turn it into a smart template, which could be personalised for each candidate on one side with a common reverse. My thanks also to our print partner, Jason Allen at D A Printers Ltd in Rochester, who also helped with the design and spent many hours working out the precise folding dimensions! I have just heard from CCHQ to ask if I would send them to InDesign files so it can be loaded onto Blueprint - which of course I am happy to do. So we now have the Boundary Commissioner's new proposals for reducing the number of parliamentary constituencies to 600 and righting an historical wrong, where some constituencies have electorates of 41,000 and others have 92,000. No reasonable or fair minded person could possibly object to this equalisation. As we begin the next round of meetings and discussions on this matter, I would like to pay tribute to the Conservative Party's boundary spokesman, Roger Pratt CBE, whose encyclopedic knowledge of every ward and polling district in the UK is only matched by his unending courtesy and good humour (at least in public) as he smooths the ruffled feathers of a thousand agitated activists, often demanding diametrically opposite outcomes. I wasn't around when the Tonbridge & Malling constituency was created in 1974, but I know some people who were. Apparently there was concern and a degree of outrage. According to those who were there, two wholly different communities were to be "forced together" to create a totally unsuitable whole. 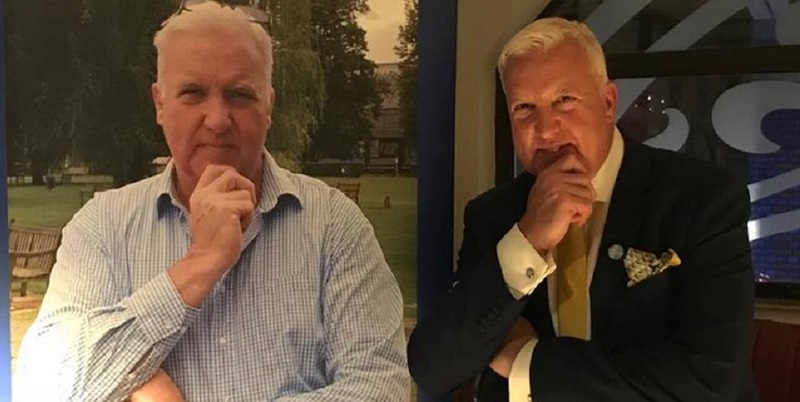 "Nobody in Malling will have anything in common with the townsfolk on Tonbridge" and "no MP, however talented, could possibly represent the needs of the fruit growers and farmers of Malling with the demands of a growing commuter town like Tonbridge." Well, that was 42 years ago - and for 40 of those years the remarkable Sir John Stanley did just that. No-one felt unrepresented, the end of the world did not come as rural and townsfolk woke up in the same constituency, and the local Conservative Association thrived to become one of the strongest and most successful in the UK. Then in 1997 those dastardly Boundary Commissioners did it again, when 20% of the constituency was 'hived off' to create the new Chatham & Aylesford seat, with those lost voters being replaced by an equal number from Sevenoaks. This time I have read the minute books from when the matter was discussed. And guess what? There was "concern and outrage" from the very same people who didn't want the two halves of the seat put together in the first place! According to a letter sent to the Boundary Commissioners, "the loss of so many rural Malling voters to the new Chatham & Aylesford Division will split this wonderful constituency and do irreparable harm to its social balance." Quite a remarkable turnaround when one considers that 14 years earlier people thought forcing Malling and Tonbridge people together would lead to Armageddon. And guess what? Since 1997 Tonbridge, Edenbridge & Malling as well as neighbouring Chatham & Aylesford have gone from strength to strength. Both Associations continue to punch above their weight, both produce election results far above the Kent, regional and national swings and both send more campaign support to those who ask for it than the rest of Kent combined. And now the Boundary Commissioners have published their latest proposals and I have little doubt that from some quarters there will be the usual "concern and outrage". But before anyone puts pen to paper of demands that "something must be done" I beg you to ask yourself a few simple questions (and these are equally applicable outside my immediate area of responsibility). 1. Is your objection based on sound legal arguments or is it based on an emotional reluctance to change? No proposed change, however small, is as simple or as isolated as it looks. Whilst such a change might be fabulous for you, it could well lead to objections from the neighbouring constituency, or the council, or the parish, or another political party or any one of a hundred community groups, each of which will have their own reasons and motivations. 2. Do you really want to open Pandora's Box? The proposed new boundaries have come from long serving, experienced and wholly independent Boundary Commissioners, and are stronger for that very reason. As soon as any political party tries to redraw the map without absolutely solid legal or constitutional reasons for doing so, it attracts attention from our opponents who understandable think that we are up to no good. They will then submit counter proposals to "head us off" and the whole debate will go to a public enquiry, with both sides slogging it out. And once this happens, anything could happen. Including the Commissioners accepting our opponent's case was better than ours and we are left licking our wounds and wishing we had kept our mouths closed. I have seen it happen more than once. 3. Does anyone really care? These things matter greatly to us, but I do wonder if people outside the bubble really care. Almost 24 hours after the Commissioners published their proposals I have received two messages. One (from a retired Party Agent) informing me that the people will be "beside themselves" with anger. The other, a call from an angry resident to tell me that "600 MPs is twice as many as we need and we should get rid of another 50%). If the people really are "beside themselves with anger" they might not be angry about the same things as we are, and they might not welcome the sight of politicians fighting like ferrets in a sack over what will appear to them as self interest. To be brutally frank, unless the proposals to totally ridiculous (and sometimes they are - like the 2005 proposal to include one inner city Liverpool ward in the suburban Cheshire seat of Wallasey, with the River Mersey in between) then I suspect the overwhelming majority of people really don't give two hoots. By their very nature, boundary changes work in our favour. As voters leave cities and settle in rural and suburban communities, so the number of rural/suburban constituencies increase and the number of urban constituencies decline. This is a right and proper outcome arising from our ever changing demography. But such good outcomes are not guaranteed. The pre 1995 boundary changes were expected to deliver 20 new Conservative-inclined constituencies, but by then the party was divided, inward and driven by self interest. As a result we had MPs arguing against their own Associations, Conservative councillors arguing against their own councils and even waring factions within Associations hiring their own barristers to fight their case at the appeals. At the end of the process, a united and focussed Labour Party come out ahead. That is a lesson for us all in the weeks and months ahead! More data = more votes! “Put number 17 down as ‘Conservative’” said an enthusiastic canvasser during a recent by-election. I looked at him sceptically, and said, “But nobody came to the door!” “Yes, but they had a Jaguar on the drive, so they must be Conservative.” Having reminded the canvasser that John Prescott had two Jags on the drive, I left the VI box blank, and moved on to the next house. How we engage with voters on the doorstep, the questions we ask and how that data is used during an election must change to reflect the society within which we now campaign. For most of us canvassing has been a simple process of asking a voter, “May we count on your support?”, and recording their intention by a simple code on a canvass card – and then reminding “our people” to vote on Polling Day. For a system developed in an era when politics was a binary choice this worked well. For the eight or so elections after the war the two main parties shared around 90% of the votes between them; if you weren’t for us, you were agin us. But times have changed. The modern campaigner must address two fundamental changes in the political landscape. 1. There is now more choice – with more parties competing across the UK, often with regional variations, and the emergence of single-issue and independent candidates. 2. Increasingly voters are willing to trade their support, often identifying for one party nationally, whilst happily voting differently at European, mayoral and devolved elections. Even in my small corner of Kent there is clear evidence of vote-splitting due to local circumstances. For example, in the 2015 GE, in just one constituency the Conservative local government vote-share was higher than the Parliamentary vote share, while in the other four constituencies it was the other way around. And, in one borough, our local share was a full 20% behind the parliamentary percentage. Until we know why 1 in 5 Conservatives failed to support their borough council candidate we will never make the progress we need to make in this Borough – but before we can rectify, we need the tools and the skills to identify. Canvassing over the years has evolved, but too slowly, as has the training we give to our canvassers. Too many people we send to the doorstep still believe they are embarking on an evangelistic mission, to find or make new converts. Whilst, in reality, we are simply gathering raw data. And just as voters’ political allegiances have become more complex, so our methods of gathering data must evolve too. I first encountered the new CCHQ canvass script at the Clacton by-election. And hated it. It seemed over-complicated and under-explained. A simple 30-second conversation on a doorstep had morphed into a five-minute double-page script with show-cards, and we were expected to interview each member of the household separately. In the heat of a by-election, particularly that one, no-one had the time to explain to the canvassers why we were doing this, or how it worked, or why it was important. Not being told the reasons led to a lack of confidence and even a degree of resentment and hostility, which clearly came across on the doorsteps. This negativity became self-fulfilling, with even the most enthusiastic volunteers translating their antagonism to the respondent. This in turn provided the canvasser with all the evidence they needed that the system was unworkable. For those who have not used the new script, the simple “May we count on your support?” question, was replaced with, “On a scale of 1 to 10, how likely are you to vote for each of these parties at the forthcoming by-election?”. The score for each party was then recorded on a survey form, along with the answers to a number of other questions on the local and national issues likely to affect their vote. I made it my business to find out the thinking behind this new script, and exactly how the data could be used to our advantage. Having done so I immediately understood both the need to change, but also the need to explain that change to our volunteers if we were going to make it a success. So how does it work, and why? Firstly we are not asking voters a binary question, when most want to give a multiple-choice answer. According to some polls only around 35% of voters are now totally committed to a political party (i.e. will always vote for that party at every election). This explains the significant increase in “Don’t knows” or “Won’t says”, something we seldom heard on the doorstep in the old days. Secondly, asking people to rate their likelihood of voting for a specific party on a scale of 1 to 10 is far less intrusive than asking them for which party they are going to vote, particularly if the voter is not fully committed, or is unprepared to self-identify. Having developed a script which produces a more accurate reflection of voters’ intentions we also need to understand how to use this nuanced data as a campaign tool. For me the ability to identify the second preferences of other parties’ supporters is increasingly important in closely-fought elections. Below are two examples of how I have used the data in West Kent. In 2015 we fought a local government by-election where it was a four-way contest between Conservative, Labour, Lib-Dem and Green, with UKIP and an independent candidate muddying the waters too. By knowing which UKIP and independent voters would choose Conservative as a second preference we were able to target our GOTV material to specific voters whilst ignoring other UKIP voters who would have preferred a Labour councillor. And by recording the issues which motivate those voters we were able to produce voter-specific pledge letters, often resulting in two or three different letters being sent to voters within the same household. The second way this new system helped was to identify Conservative pledges who were seriously considering voting for another party. These voters also received targeted mail, dealing with the issues important to them, just as it provided our candidate the opportunity to spend his time talking to the swing-voters who would decide the outcome of the election. Our vote share was only 27%, but we won with a majority of 53 votes. Without the data provided by this new canvassing method, and the ability to target specific voters, we would not have won. As too often happens, changes are “handed down” without the training and support needed, nor any explanation as to why these changes have been made. Like most Conservatives I am resistant to change for change’s sake, but once I am convinced of the reasons why, I become the most enthusiastic convert. You can, it turns out, teach an old dog new tricks – but he needs a reward. For the dog it is a tasty tidbit, for us it is victory. One of the many joys of my job are reading some of the absurd emails which I am cc'd into. Yesterday brought a prime example. Into my inbox landed a wide circulation email from a local councillor, one of those cc'd to everyone in the address book regardless of their interest or involvement with the topic. Apparently it was disturbing that "ten local members sitting around a room can decide who is the Conservative candidate for the ward." These changes "imposed by London" are "disgusting and must be challenged." This outburst struck me as somewhat odd as last time this particular councillor was reselected, the committee that did so consisted of three elderly men (none of whom lived in the ward this councillor represented). This arrangement however did not strike the councillor as "disgusting" as there is an email on file in which the Local Government Committee are thanked for "getting these formalities over with so quickly". Isn't it strange that when three chums reselect their friends, it's fine. But when our members (who pay their subscriptions and deliver the leaflets and donate their time) dare to choose the candidate who represents their local community, the process is "disgusting and must be challenged." West Kent Conservatives are honoured that one of the great reforming politicians of recent history, the Rt Hon The Lord Baker of Dorking CH (Kenneth Baker) has accepted our invitation to speak about his remarkable life and achievements. Kenneth Baker was a significant figure in politics in the late 20th century, holding governmental office for over three decades and serving three Conservative Prime Ministers; Ted Heath, Margaret Thatcher and John Major. During that time he was Minister for Information Technology, Secretary of State for the Environment, Chairman of the Conservative Party and Home Secretary. Upon retiring from Parliament at the 1997 General Election he was elevated to the House of Lords as Baron Baker of Dorking. In 2011 he formed a charity called the Baker Dearing Educational Trust to develop and promote the concept of university technical colleges. Lord Baker will be guest of honour at the next in our series of An Audience with.... to be held on Thursday 24 November 2016 at Hadlow Manor Hotel, Goose Green, Hadlow TN11 0JH. The show will commence promptly at 7pm, when Lord Baker will be interviewed on stage by Tom Tugendhat MBE MP. There will be ample opportunity for members of the audience to ask questions. 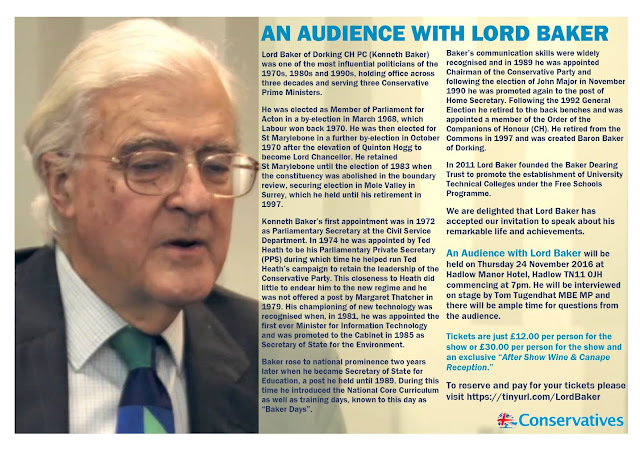 Tickets for An Audience with Lord Baker are just £12.00 per person for the show only, or £30.00 per person if you would like to stay for the "after-show wine and canape reception" when guests will have the opportunity to meet Lord Baker and Tom Tugendhat personally. Tickets for the reception are limited to just 40 guests. The fastest and simplest way to book tickets is via the payment button below using a credit/debit card or PayPal (50p booking fee applies). 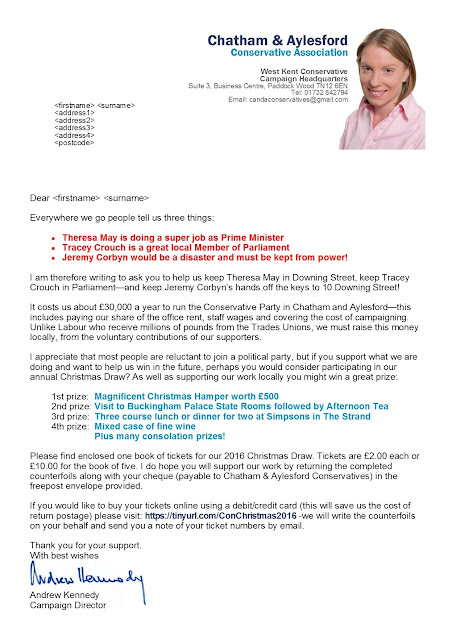 Alternatively, please send a cheque (payable to West Kent Conservatives) for either £12.00pp or £30.00pp to Campaign HQ, Suite 3, Business Centre, Commercial Road, Paddock Wood TN12 6EN. Please write "Lord Baker event" along with your name and address on the reverse of the cheque. Members moving house - we really must do better! An email received today hit one of my (many) raw nerves. It was from a member who had received an invitation to our new members' reception and had emailed to say that he was far from a new member, but had been an active member for many decades and had lapsed when he moved house. This is an issue which has been irritating me for years. 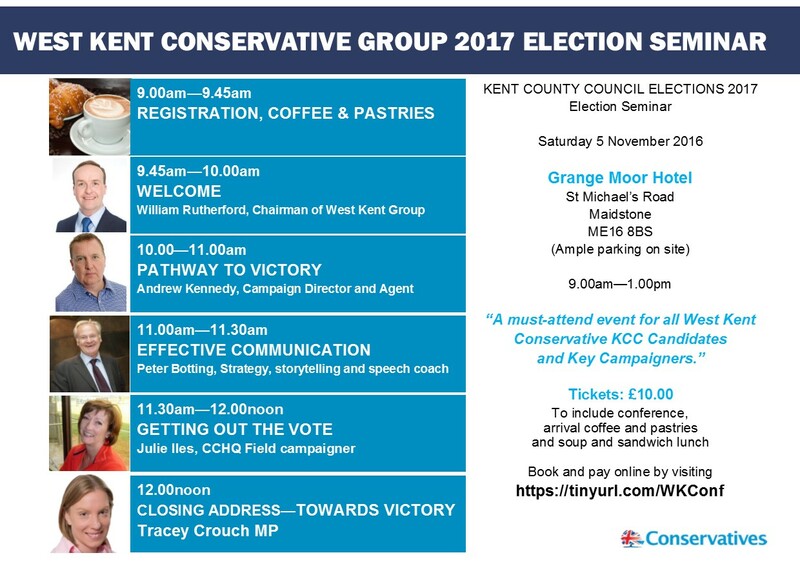 Last year I notified 36 Conservative Associations (including some very safe seats with paid staff/organisers) of the fact that a local member from West Kent was moving into their constituency. In each case I gave them the name and address where the member was moving to along with the membership details. Some of these removals were longstanding and active members (Branch Chairmen, Association Officers, former - and perhaps future - council candidates). Around half of these people were never contacted again. Some rejoined in Kent as they wanted to continue to support the Party. Many more I suspect simply fell by the wayside (as did our correspondent above, until we contacted him a few weeks ago). Each year we must lose thousands of members due to this inefficiency. In theory as many members must move into the five West Kent Associations as move out, but last year I received just one email to inform me of someone moving to our area (who is now active locally). This is, I must say, not something we can blame on VoteSource or CCHQ. It is plain inefficiency! And we really should do better. The five West Kent Associations are each holding some form of welcome party for our new members, almost 600 in total who have joined us since June. 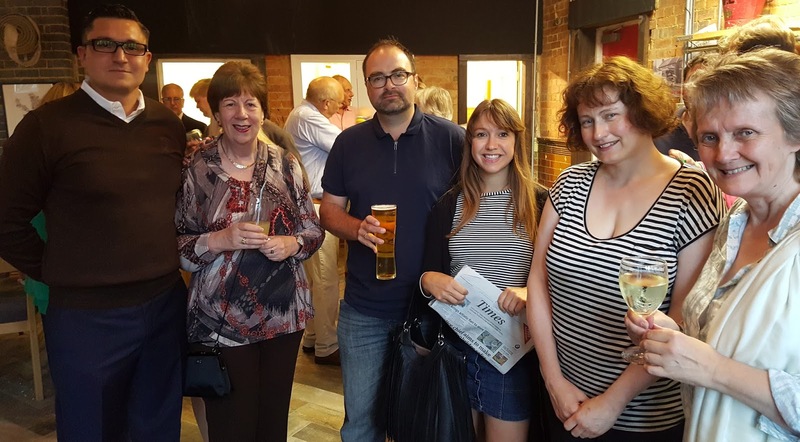 The first of the welcome parties was held two days ago at the popular "pop-up" venue of The old Fire Station in Tonbridge town centre. 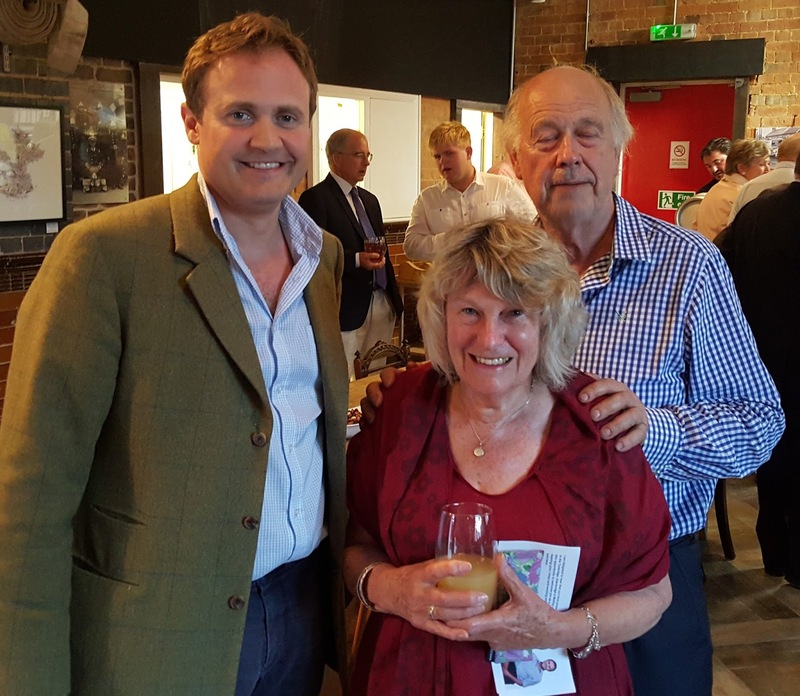 Around 30 new members attended and heard from Association Chairman, Michael Payne, and Tonbridge & Malling MP, Tom Tugendhat MBE. In welcoming the members Tom spoke of the importance of political engagement and the need for active citizens who helped shape their communities. Tom said the membership was vitally important but should not be seen as an end in itself, but rather a means to achieving an end - that being to ensure a Conservative voice was heard at all levels of government. A large, vibrant and active membership was key to achieving that, but was also vital to ensuring the party had eyes and ears in every town and village, enabling it to truly represent the wider community. It was encouraging for me to see so many younger new members, many in their 20s and 30s - and apart from one or two whose membership had lapsed in recent years, none of those attending had ever been politically active before. Maidstone's welcome party is tomorrow and next weekend Chatham & Aylesford and Tunbridge Wells are hosting theirs. One swallow might not a summer make, but the arrival of the Christmas Raffle Tickets certainly indicates the end of it.